AddressThe address for this sale in Orlando, FL 32804 will no longer be shown since it has already ended. MIKE TUDOR ESTATES SALES IS FULLY LICENSED AND INSURED FOR ONE MILLION DOLLARS PERSONAL LIABILITY AND TWO HUNDRED FIFTY THOUSAND FOR ESTATE CONTENTS. ** NO PURSES OR BAGS! ALL SALES FINAL! ** Delivery Service Available** Cash ,Checks & Credit Cards! . PLEASE NO!! PARKING ON PROPERTY OF COUNTRY CLUB TOWNHOMES -- SEE ATTENDANT FOR PARKING!! 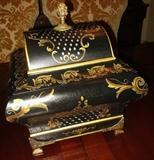 DUE TO PARKING ISSUES AT COUNTRY CLUB OF ORLANDO TOWNHOMES - ITEMS PRESENTED CAN BE SOLD BEFORE ESTATE SALE DATE!!! ITEMS ARE FOR SALE NOW!! ASKING PRICES & DESCRIPTIONS LISTED!! PLEASE CALL 407.865.1004 - TO DISCUSS PRICES!! PAIR - MAITLAND SMITH DECORATOR LAMPS - ORIGINAL: $ 2,200 EACH - ASKING: $ 750 EACH - SOLD!!! LARGE JAMALI PRINT - LIMITED - ORIGINAL: $ 4,800 -- ASKING: $ 3,500 ---SOLD!!! LARGE UNIQUE FISH BOWL - ORIGINAL: $ 500 -- ASKING $ 250 -- SOLD!!! PAIR - RALPH LAUREN CHAIRS - ZEBRA W/LEATHER SEATS - ORIGINAL: $ 7,800 EACH - ASKING: $ 2,200 EACH - SOLD!!! 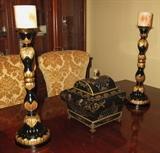 PAIR - TALL CANDLESTICKS - ORIGINAL $ 325 EACH - ASKING: $ 175 EACH - SOLD!! !